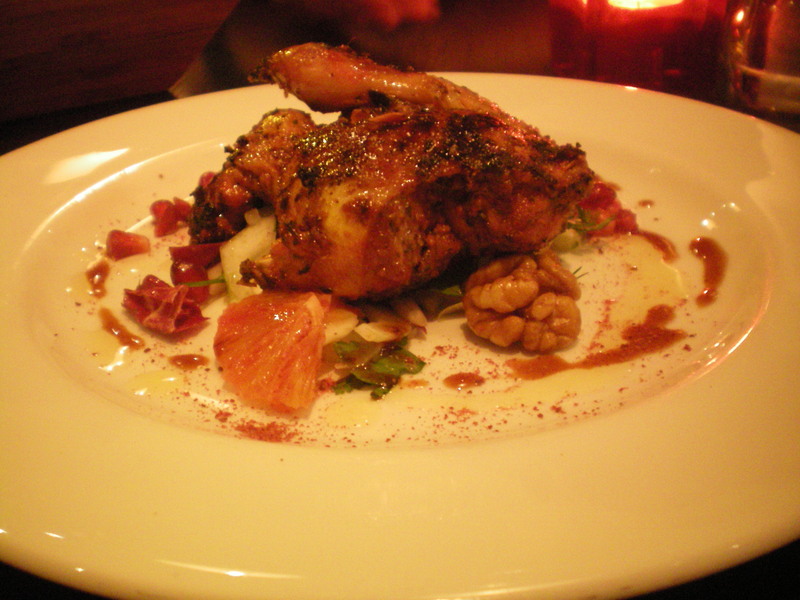 Culinary Tours of Turkey & Lebanon @ The Souk Kitchen – book now! Whether you’re an avid eater of Middle Eastern food, or know nothing about it but are up for trying new things, it’s worth considering booking yourself in for one of Bedminster’s Souk Kitchen’s upcoming “culinary tours” of Turkey and Lebanon. Just £24 per head provided diners with a wonderful four course meal, with a choice of two starters, two mains and two desserts. My friend Danielle and I decided to opt for one of each and share, giving us a chance to sample a bit of everything…although we bypassed the Persian rice pudding dessert and went for the lighter option, as we were a little full by that point! The menu that we were presented with made little sense to either of us, having little or no experience of Iranian cuisine before that evening. Luckily, however, co-owner Ella, whose father is Iranian, was on hand to talk us through the options and Iranian dining traditions before the time came to order. 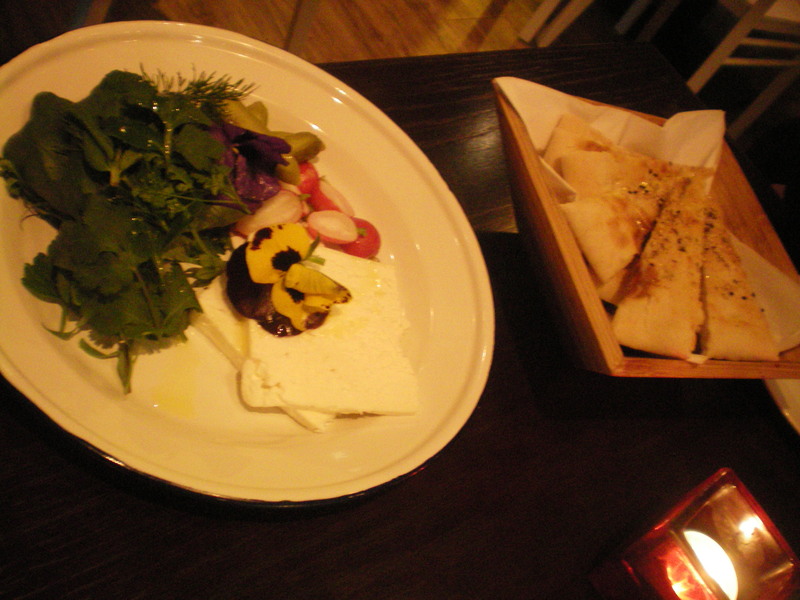 We began with a basket of Iranian naan bread and a plate of sabzi khordan and paneer: a herb salad served with slices of crumbly cheese, gherkins and radishes. Sabzi khordan is, Ella tells us, a traditional accompaniment to any Iranian meal, where it is always served alongside the main dishes. 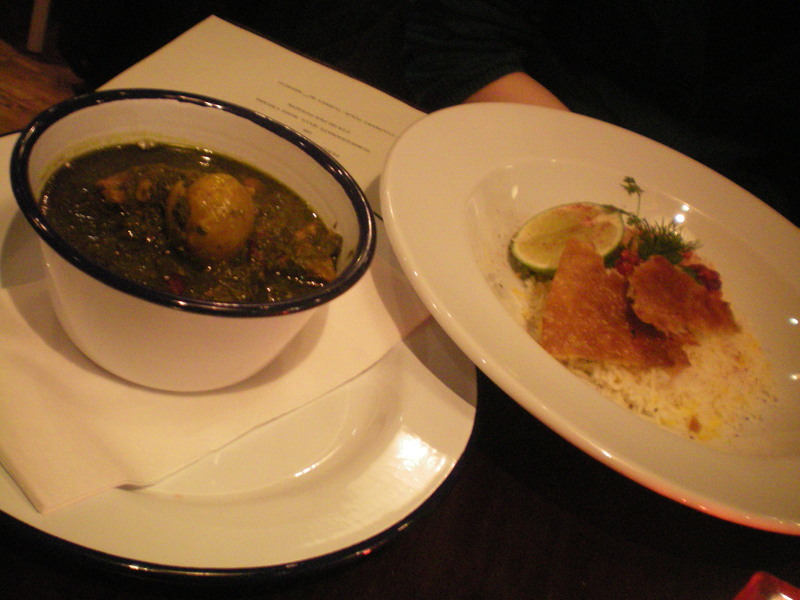 Main courses were both served with a cucumber salad with sekanjebeen: a mint and vinegar syrup dressing. 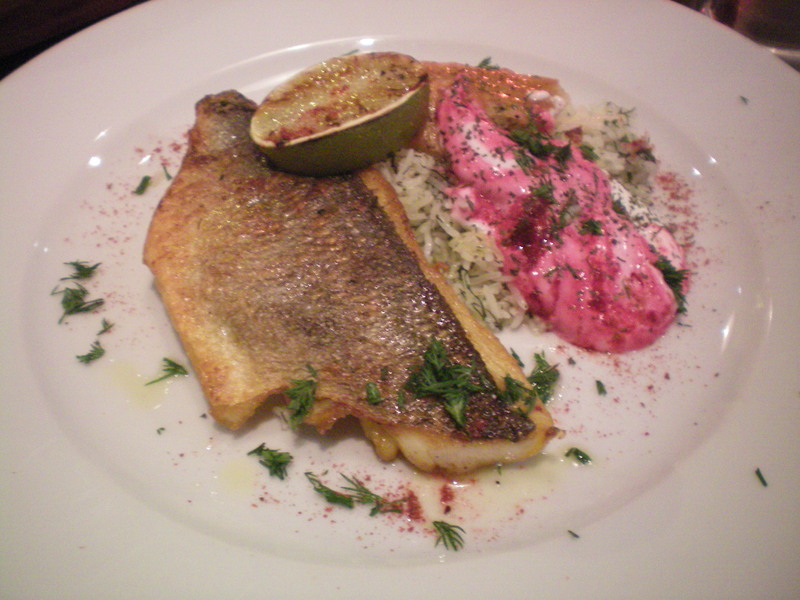 The perfectly cooked pan fried sea bream was served with sheveed polow (rice with dill) and a beetroot puree-infused yoghurt, while our khoresht-e ghormeh sabzi turned out to be a very rich and warming lamb and herb stew, with dried limes adding a beautiful tang to the combination. This was served with a traditional saffron yoghurt rice, topped with a chewy yet crunchy concoction which was incredibly more-ish – we were told that this was the crispy bit from the bottom of the rice pan, but it tasted fantastic! We passed up the opportunity, as mentioned earlier, to try the Persian rice pudding as we were starting to feel a little full. 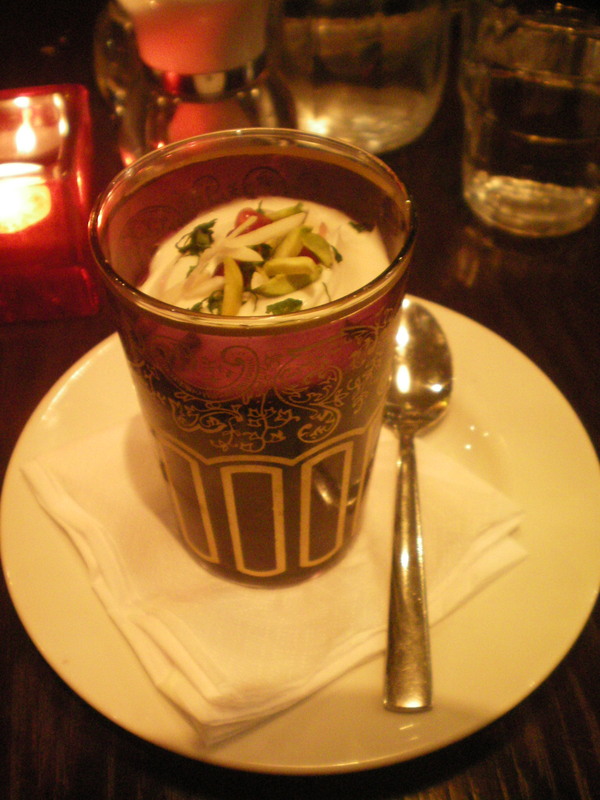 Instead, we both opted for the second dessert option: a beautiful glass filled with a refreshing yet tangy pomegranate jelly, and topped with a sweet, delicately flavoured rose cream, slivers of pistachio and pomegranate. Absolutely delicious, and the perfect end to a fantastic journey through a variety of flavours that we’d never tried before. If this sounds like your sort of evening, then book yourself a table for one of the upcoming culinary tours at Souk Kitchen – either Turkey on March 30th, or Lebanon on April 26th. If the food and the service that we experienced on our visit are anything to go by, then you’re guaranteed to have a fantastic evening. To book, call the restaurant on 0117 9666880, or email soukkitchenbriz@gmail.com. 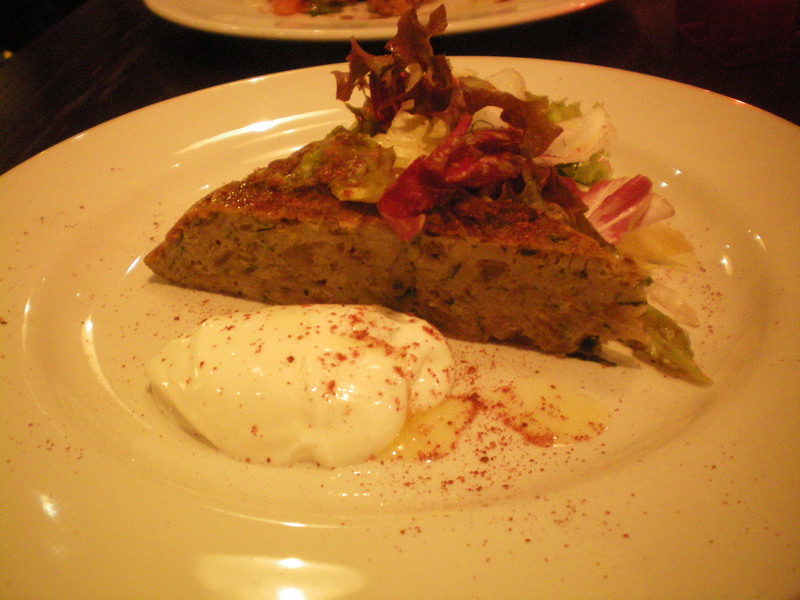 One Response to Culinary Tours of Turkey & Lebanon @ The Souk Kitchen – book now!